The CAN in Automation (CiA) Product Guides for CAN, CANopen, and J1939 provide systematically information about products and services as well as sales contacts worldwide. They are highly integrated into the CAN Newsletter Online. Reading an article about a specific topic (e.g. I/O module) provides automatically those product guide entries with related products by means of sponsored links. Of course, the reader can also browse through the product guides independent of the online magazine. The CAN Product Guide is not related to any higher-layer protocol. Here you find information from the chip level (micro-controller, CAN controller, and transceiver) up to the system level (tools and development services). 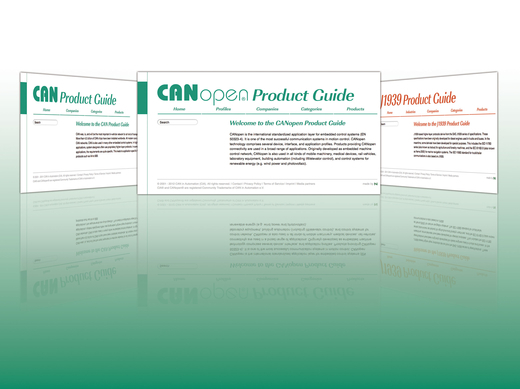 The CANopen Product Guide provides for all devices a standardized feature list, which simplifies the selection of CANopen products. The J1939 Product Guide is a unique information source for designers of commercial vehicles, in particular diesel engine powered vehicles. Of course, the professionally edited publications need to be financed. There is no free lunch! The editors and the administrational staff need to be fed. The printing house, the post mailing, and the web provider cause some additional expenses. If you like to advertise your products and services, there are several opportunities. There are the classic advertisements in the printed version of the CAN Newsletter. Or you can order a banner in the CAN Newsletter Online publication for a period of time (e.g. three months). Other options are the sponsored links: The topic-related links are temporarily bookable, while the article-related links are permanent. The entries in the CiA Product Guides are also time-limited (e.g. for one year). Links to your product or service entry appear automatically as sponsored links in the related “frame” of the CAN Newsletter Online. Keep in mind that most of these advertisement opportunities improve mainly the image of your company. Don’t count just clicks or leads. CAN is not a short-term business as cellular phones, it is an investment business, where your company’s long-term image counts. With your advertisement you are part of the community, and your business increases substantially. Don’t live from hand to mouth. By the way, the prices for the advertisements are very reasonable. We are nonprofit.